Ferrero has always taken its responsibilities concerning the consumption of its products very seriously. The main proof of this commitment is the size of its portions, which have always been designed and marketed to be suited to different nutritional requirements. 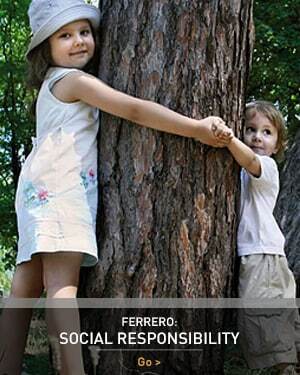 In addition to this basic feature, and supporting each individual person’s right to free choice, Ferrero has always focused on advertising campaigns which address mothers directly. We believe that, thanks to the trust gained over the years from parents, who have increasingly appreciated the standards and quality of Ferrero products, with its portions suited to a certain age and a certain level of physical activity, this helps parents to provide their children with the appropriate levels of nutrition and energy. It is for this reason that we believe – as all the most recent nutritional studies confirm – that it is better to eat at regular intervals throughout the day. Our products are designed to help reach the necessary nutritional balance, thanks to the calcium from milk and the supply of nutrients essential for growth, present in our products owing to the mild technologies they undergo and which guarantee these nutrients’ conservation to the highest extent.